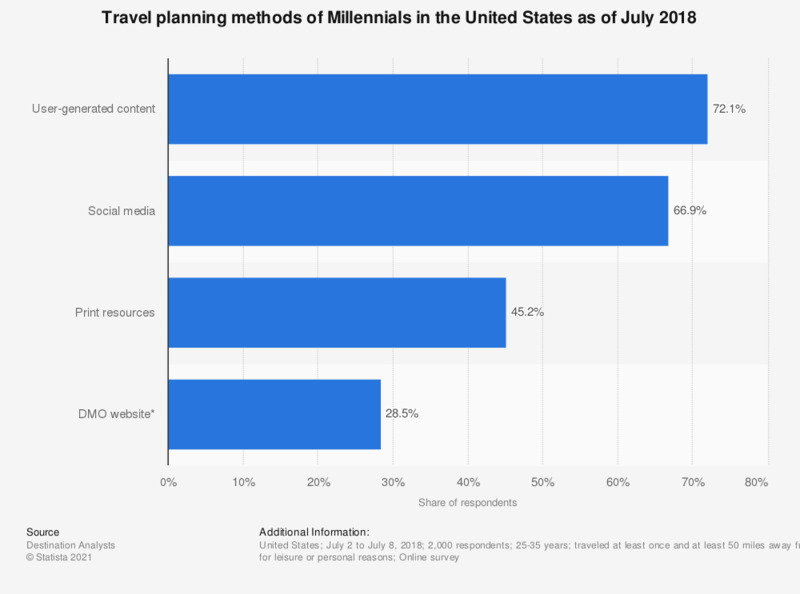 This statistic shows the travel planning methods of Millennials in the United States as of July 2018. During the survey, 72.1 percent of Millennial respondents said they used user-generated content for travel planning. Which of the following sources of information do you use to gather ideas and inspiration for your vacations? Which of the following would you never leave home without before embarking on a great Canadian road trip? What type of winter travel are you planning? Which of the following, if any, would you/do you do as a way to prepare yourself for trips for pleasure or leisure? Which device do you use most to research your leisure travel choices? Which of these statements do you agree with?